It’s been a beautiful way to clear my head! Sometimes you just have to punish a misbehaving project! Love this hat, both the yarn and the pattern. It was a fit/ease issue with the sweater. I’ve lost almost 20lbs over the last couple months and I’m having to re-learn how garments fit my body. Thankfully, I set it aside and tried it back on at home & after adding a bit of length I opted to keep it as is. It’s very relaxed now, but I’m sure I’ll wear it a lot. The hat started very slow, but then flew. All it needs is the pom-pom on the top now! Congrats on the weight loss! I think you’ll be happy not having redone it. 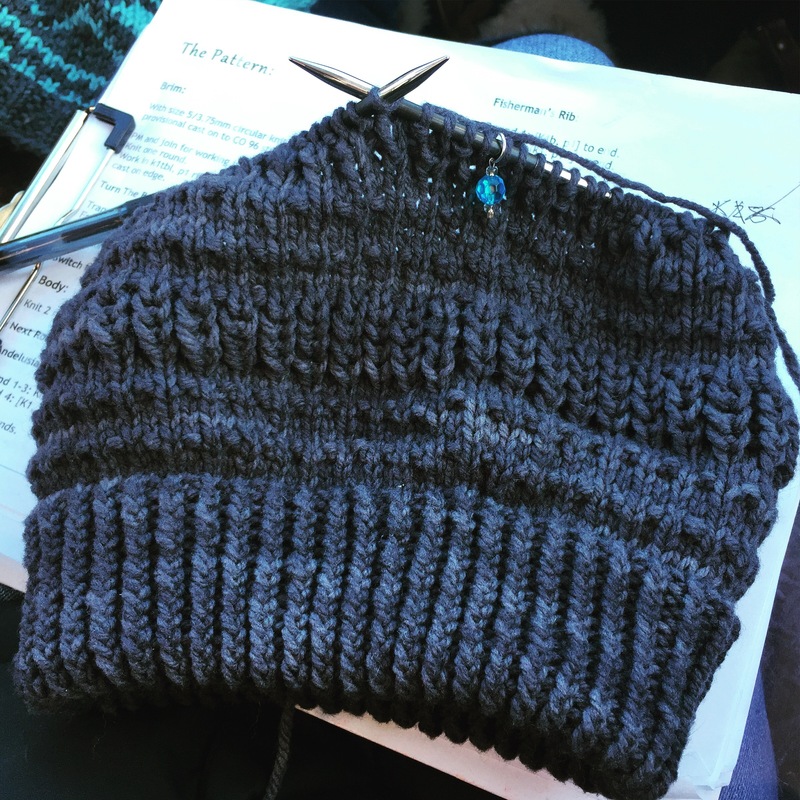 You spend a lot of time in either comfy (knitting at home while teaching the kids) or active (hiking around out of doors) that a piece that’s less fitting ought to be a great choice. Besides, then it’s perfect for layering too! Thank you! I really have to thank my hubby — he’s the one who told me to wait and take another look at home. His argument was the same — I’m very much a relaxed dresser! Although, I’m not sure how much I’ll layer as it’s a rather warm sweater! Its amazing what a new project can do! Very pretty! How did you achieve the section of larger stitches? It’s a Fisherman’s Rib that uses knit 1 below (k1b) and purl 1 below (p1b) which knits up almost like brioche. Very simple once you get rolling — I’d definitely recommend trying this pattern to get a feel for it. I can’t remember if I mentioned it or not! Either way, it’s Timber Bay by Melissa Schaschwary.